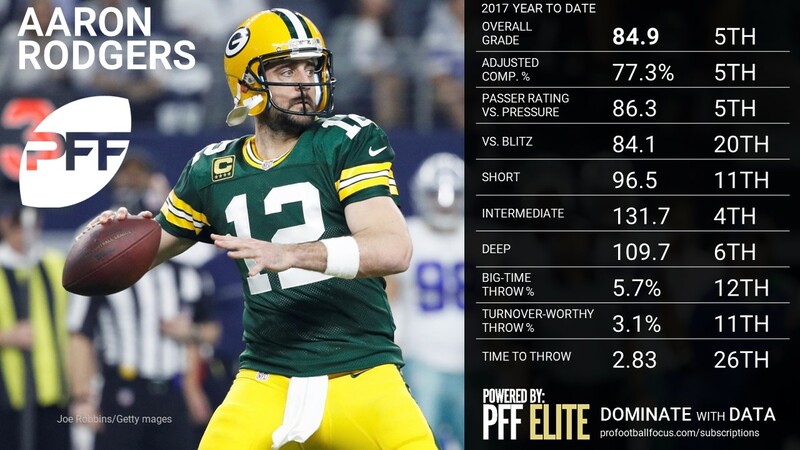 After each week of the NFL season, we’ve given you a quarterback overview with detailed notes and a list of traditional and advanced stats on all 32 team’s starting signal-caller. 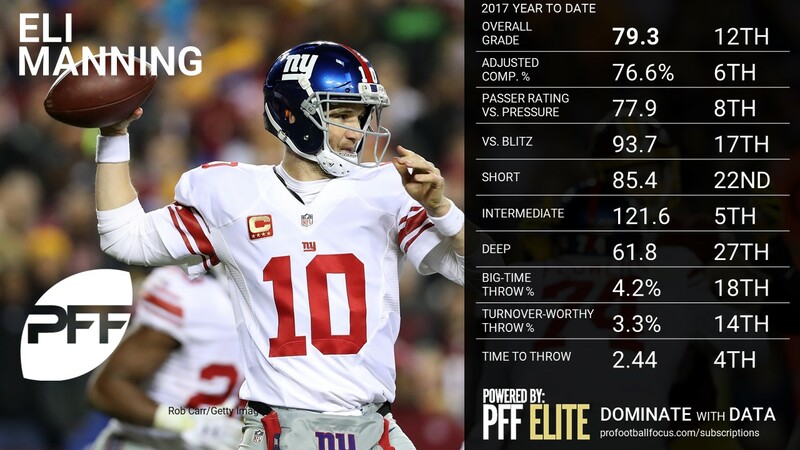 Now six weeks into the year, and with a much better sample size, these numbers are in need of everyone’s favorite: quarterback rankings. 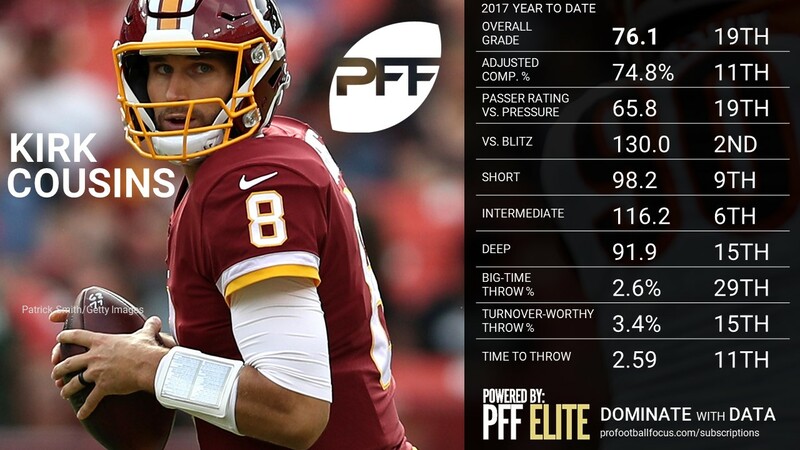 PFF Analysts Steve Palazzolo and Zac Robinson give you an overview of every team’s quarterback, and where they rank in terms of overall PFF grade as well as detailed notes on a select few who stood out for good, or bad, reasons in Week 6. 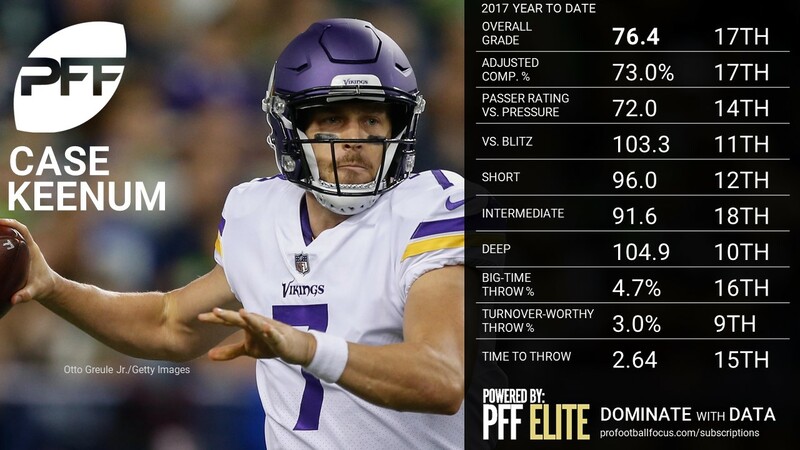 These rankings are based on their overall grades after Week 6, and can be found as a part of the PFF Edge subscription. 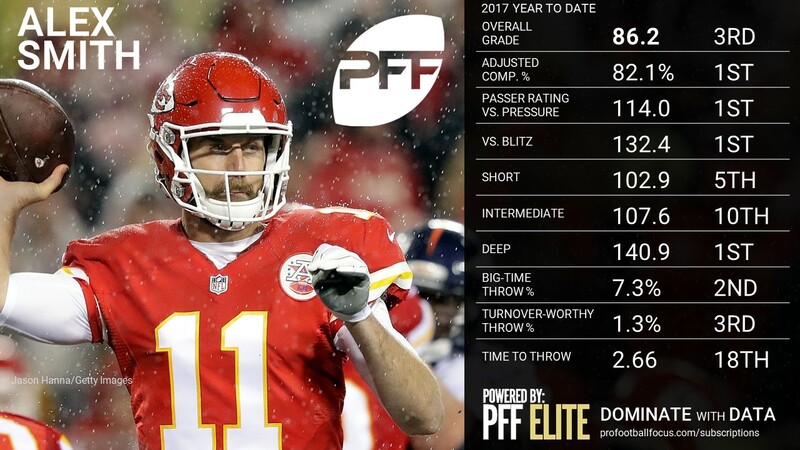 The Chiefs’ offense struggled in all phases against the Pittsburgh Steelers and it took a while for Smith to get going. 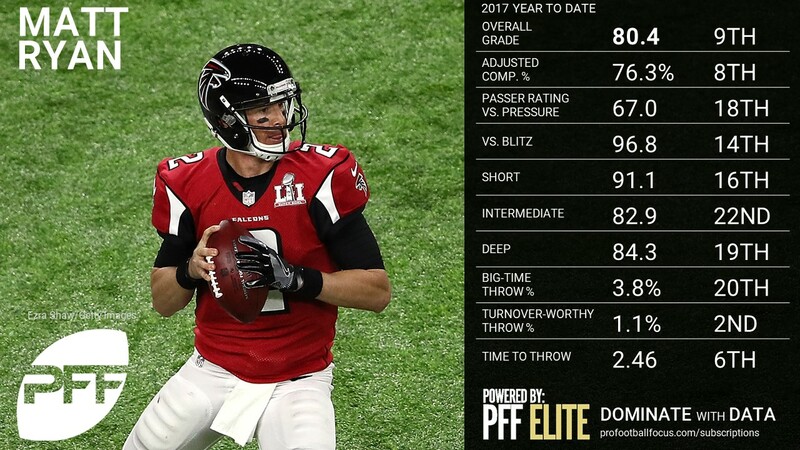 He had an early turnover-worthy play that fell incomplete, but it was his late-game misses that stood out most, particularly an overthrow in the end zone to a wide open receiver on a busted coverage. 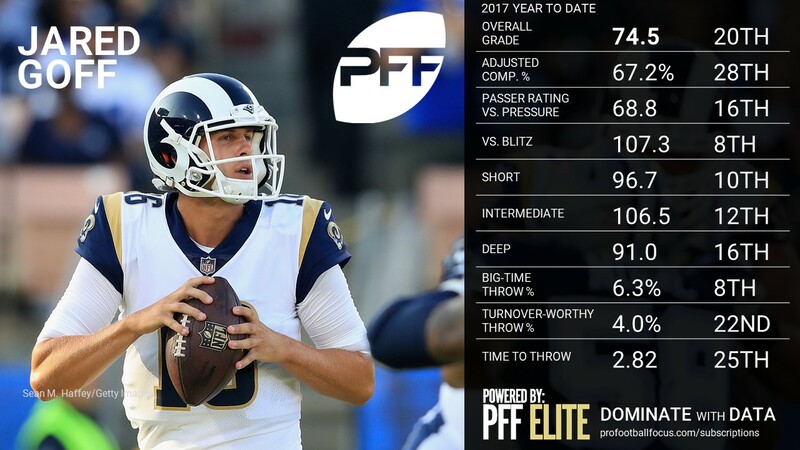 Smith continued to make a few plays after breaking out of the pocket and that kept Kansas City in the game, but they ultimately fell short as Smith’s adjusted completion percentage of 66.7 percent ranked 21st in the NFL this week and he completed just 5-of-12 including the dropped interception on passes thrown at least 10 yards in the air. 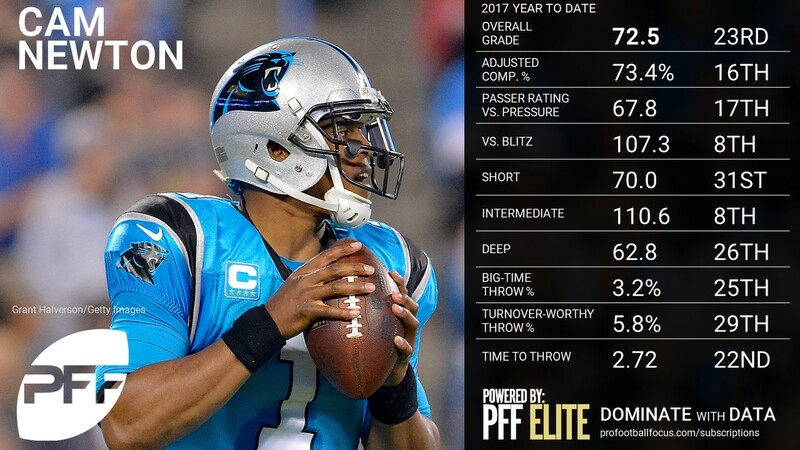 Wentz continued his strong play with a number of big throws against the Carolina Panthers on Thursday Night Football. 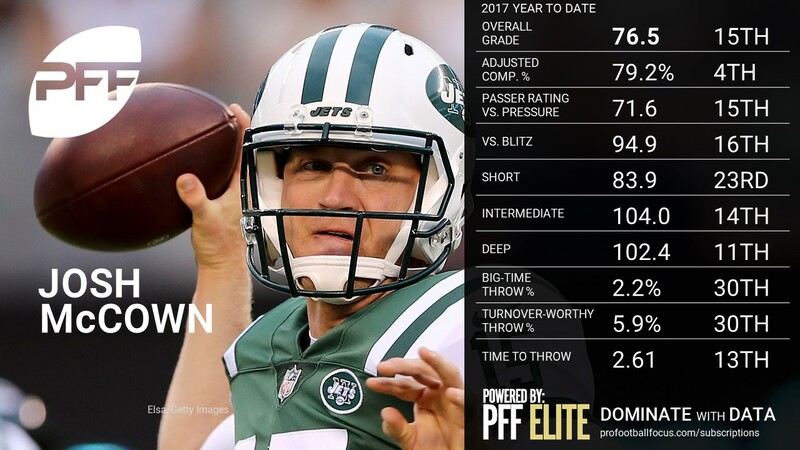 Whether extending plays on third down or dropping a deep ball in the bucket, Wentz continues to hit on a high percentage of positively-graded throws, now ranking third in the NFL in that department. 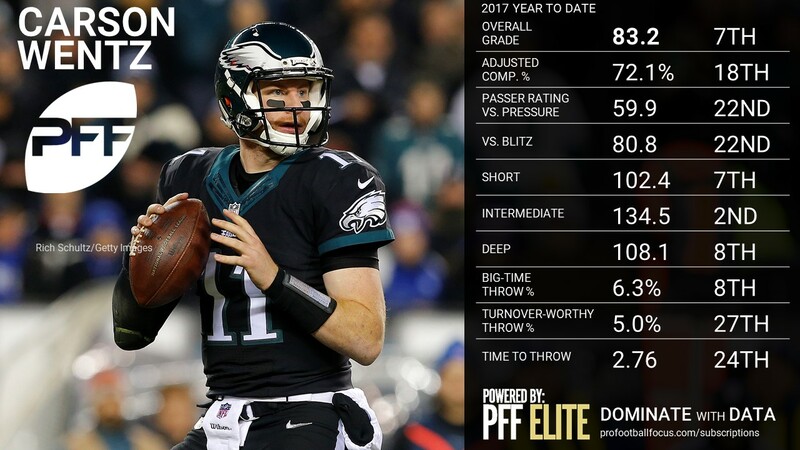 The next step is cutting back on some of the negatively-graded throws where he has the eighth-highest percentage in league, but there’s been more good than bad to Wentz’s game, particularly over the last two weeks. 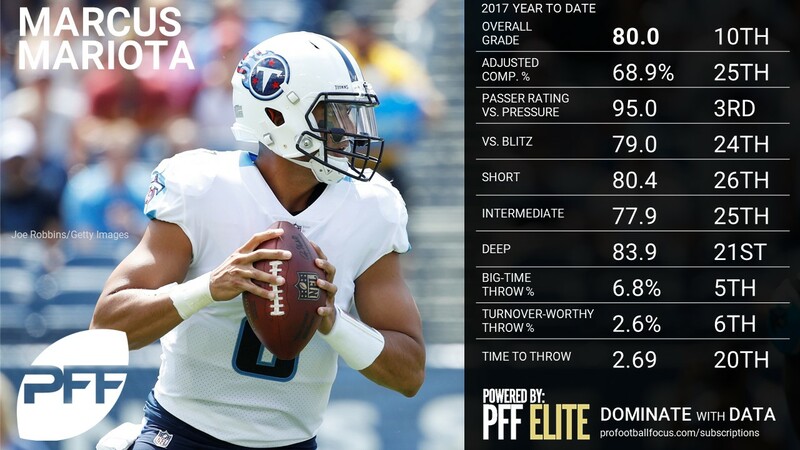 Despite a slow start, Mariota managed to make a number of big throws on his way to Western & Southern Team of the Week honors. 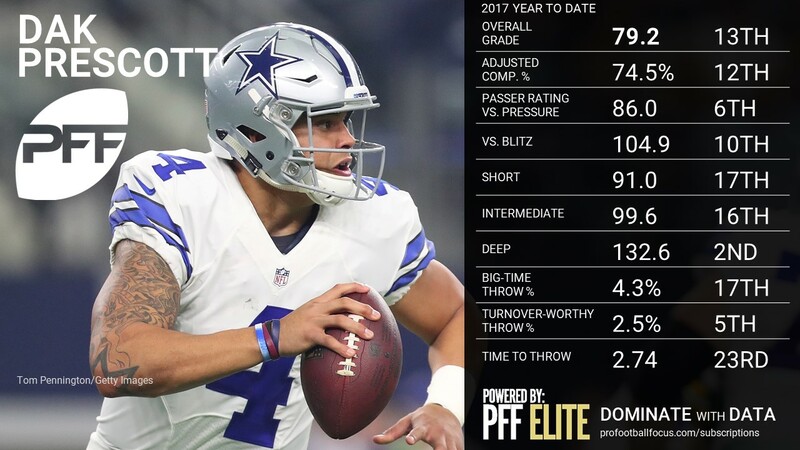 He was outstanding under pressure, completing 6-of-7 for 129 yards and a touchdown, good for a perfect passer rating of 158.3 and he dominated off play action, completing 10-of-11 for 185 yards, one touchdown, and a passer rating of 149.1. 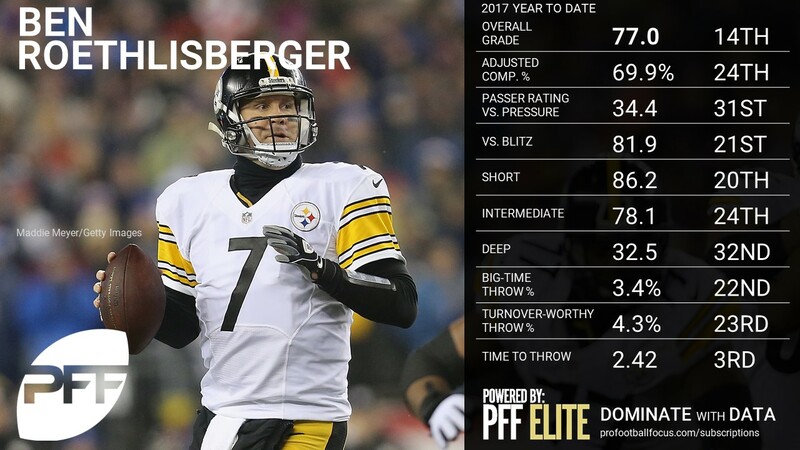 Roethlisberger bounced back nicely with a solid game across the board using primarily a controlled quick passing game throwing a number of screens and slants. 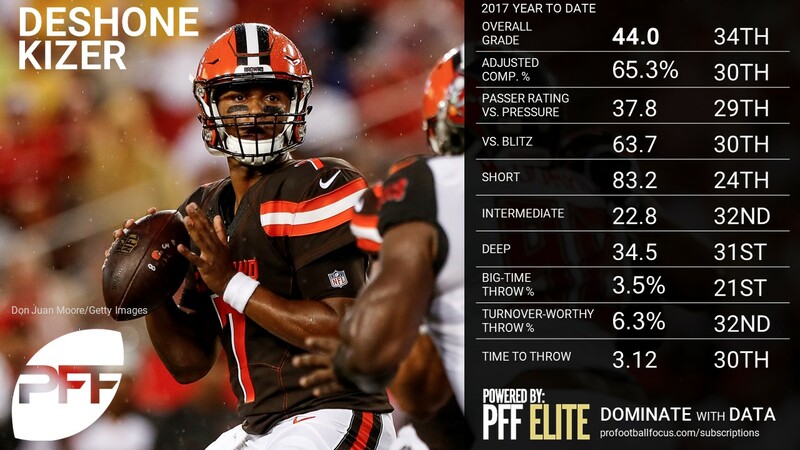 He was able to find a few big plays down the field to Antonio Brown and Vance McDonald on play action deep crosses, and later Brown on a seam route that went for 30 yards. His lone interception came on a stopped slant route by Antonio Brown that ended up in the hands of Marcus Peters. A week after having some misfortune on a couple of his five interceptions, Roethlisberger was on the right end of a dropped one by Phillip Gaines that ended in the hands of Brown and him taking it for the game-sealing touchdown. 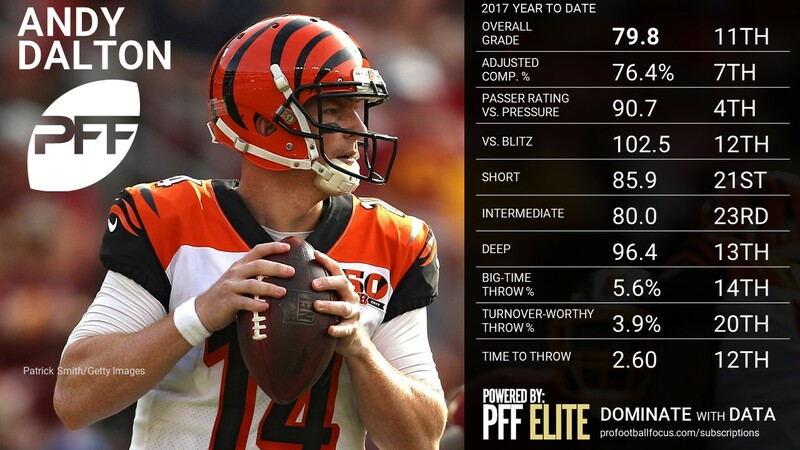 The offensive line and the quick passing game led Roethlisberger to being the least pressured passer in Week 6, under duress on just four of his 26 dropbacks. Palmer got off to a hot start, hitting his first 13 passes, consistently finding the holes in the in the Buccaneers zone heavy scheme. 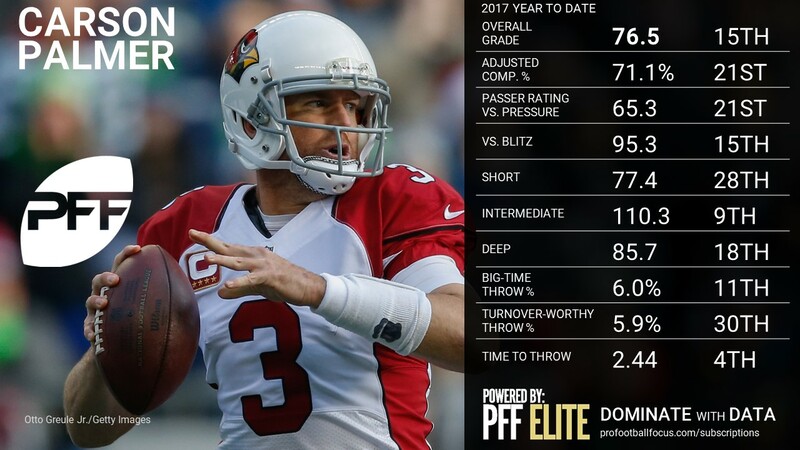 Palmer worked the intermediate level (10-19) extremely well, going 11-of-11 for 206 yards and three touchdowns in that range, hitting a number of seam routes for big gains. His lone big mistake came on a deep post attempt under pressure that left the ball short and in the arms of Brent Grimes for an interception. 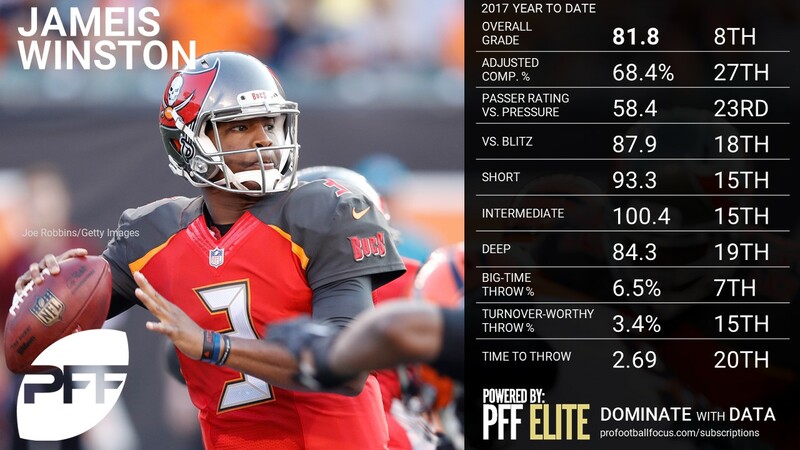 The second wasn’t as smooth as half the Buccaneers tightened up their coverage a good bit, but his lights out first half half was enough to hold off a late Bucs charge. 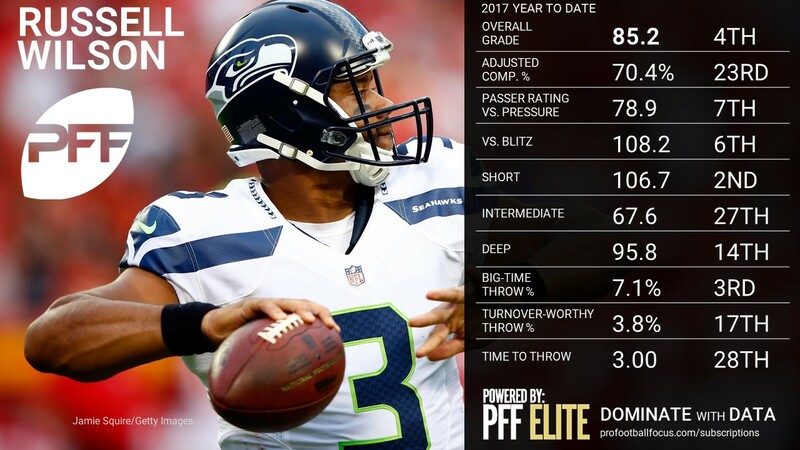 Palmer’s 138.1 passer rating in a clean pocket was tops in the NFL this week. 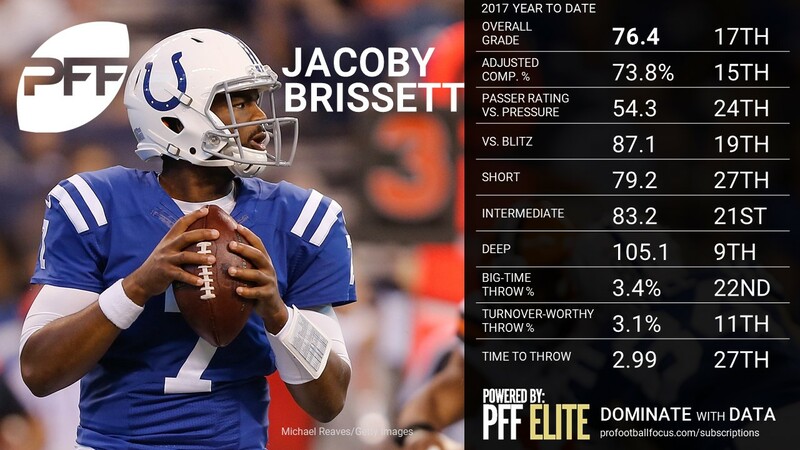 Brissett made a number of big throws early and continues to impress and run the Colts offense efficiently regarding the circumstances. 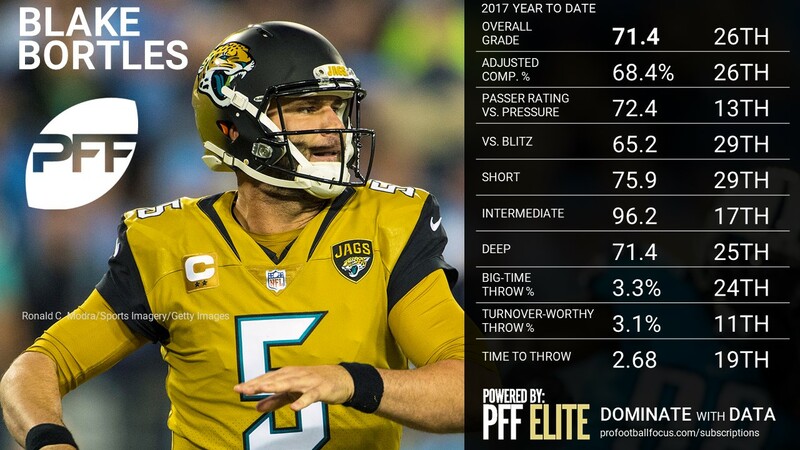 He had perhaps one of the best throws of the week facing a first quarter third and 11 in the red zone, throwing a dart on a seam route to Donte Moncrief that he dropped for a would-be touchdown. 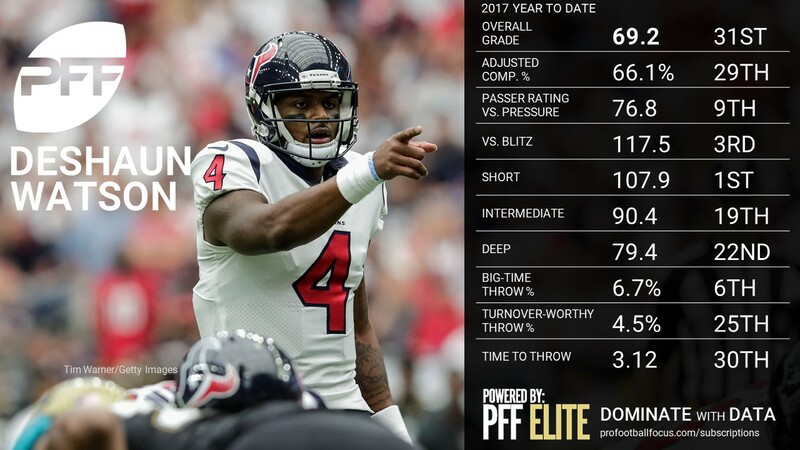 Brissett impressed with a number of accurate throws outside the numbers, but was also fortunate on a dropped interception by Logan Ryan under duress in the third quarter. On the night, Brissett struggled to find completions under pressure, going just 1-of-9 for 16 yards under duress. 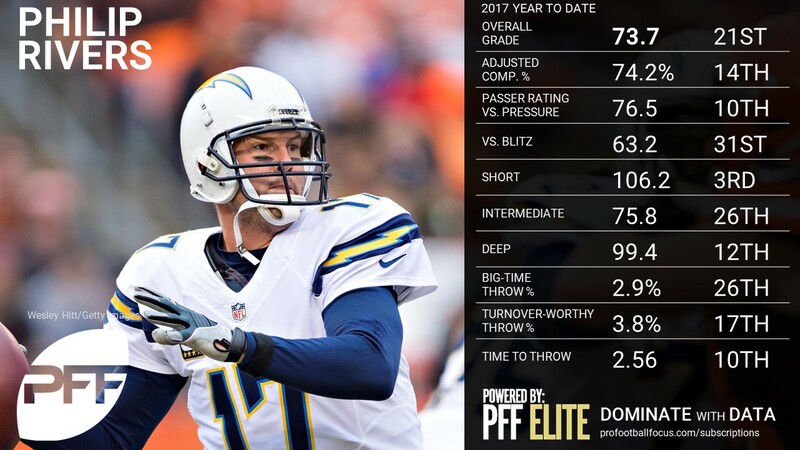 Rivers got away with an early dropped interception, but he settled down and made a number of big-time throws, particularly down the stretch. 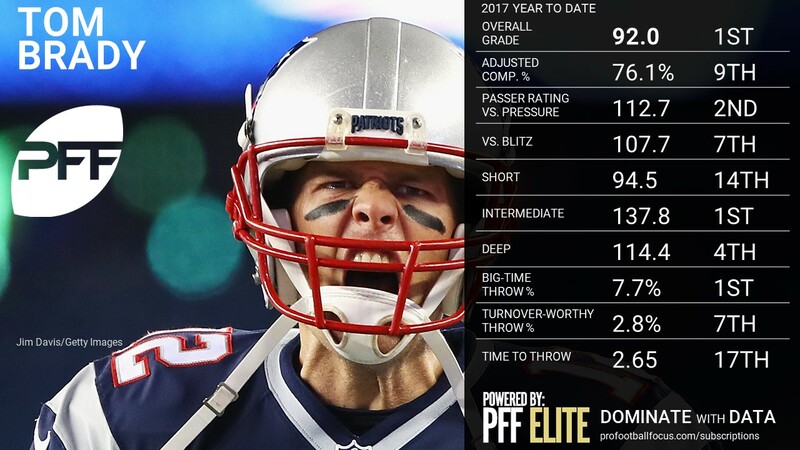 His “dig” route early in the second quarter was a thing of beauty as he threw it with perfect anticipation, touch and ball location for the big gain and he hit two big corner routes in the fourth quarter, showing that he still has what it takes to get the ball down the field. 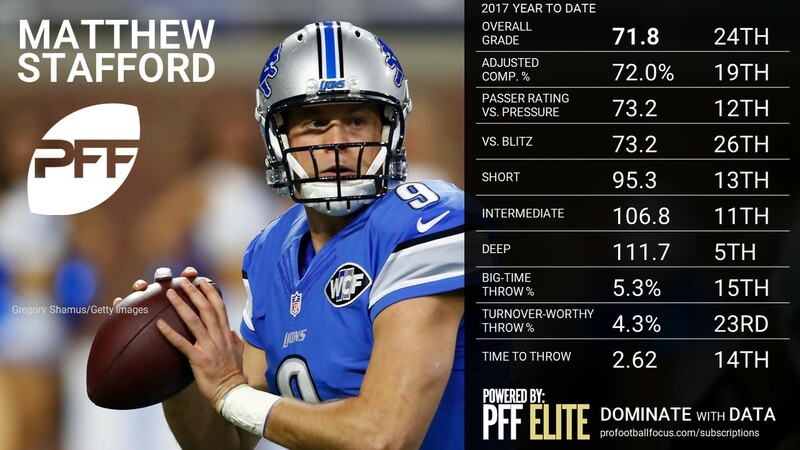 Coming into the game battling an ankle injury, it was a tough day across the board for Stafford who had his share of bad luck as well. 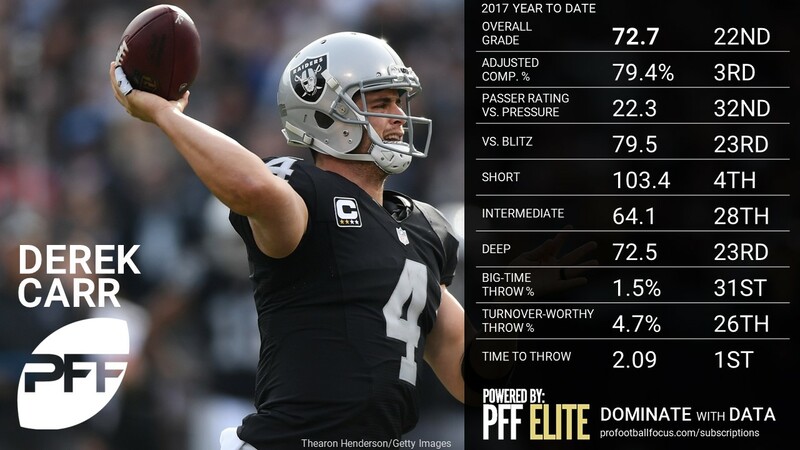 The ball was bouncing all over the place, with nine batted passes at the line of scrimmage including two that resulted in interceptions for touchdowns. Stafford’s other interception came on an angle route that was dropped by Theo Riddick and tipped up in the air. As they did a year ago, the Saints came after Stafford with a number of blitzes, mostly playing man to man behind it. 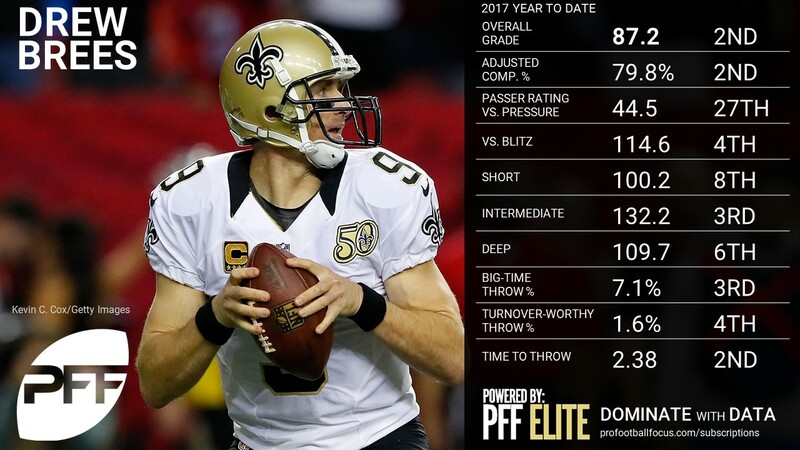 The Saints defense blitzed him on a staggering 34 of his 59 dropbacks, resulting in a 62.9 passer rating when they did so. 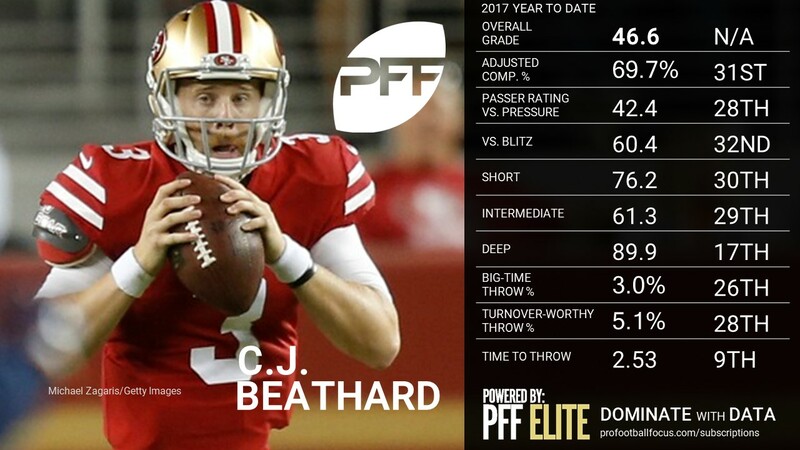 Although it was a tough day Stafford made it interesting hitting a number of big plays down the field in the second half. Scheme wise, this was not a great matchup for Siemian and the Broncos as the Giants array of coverages caused him some indecisions post snap which resulted in a number of turnover worthy plays. Siemian locked onto to Bennie Fowler in the flat where Janoris Jenkins made a nice play, jumping the route and taking it for a crucial pick-6 at the end of the half to give the Giants a comfortable 17-3 halftime lead. He was able to find success on a number of big throws up the seams including a strike in the fourth quarter to Jeff Heuerman. 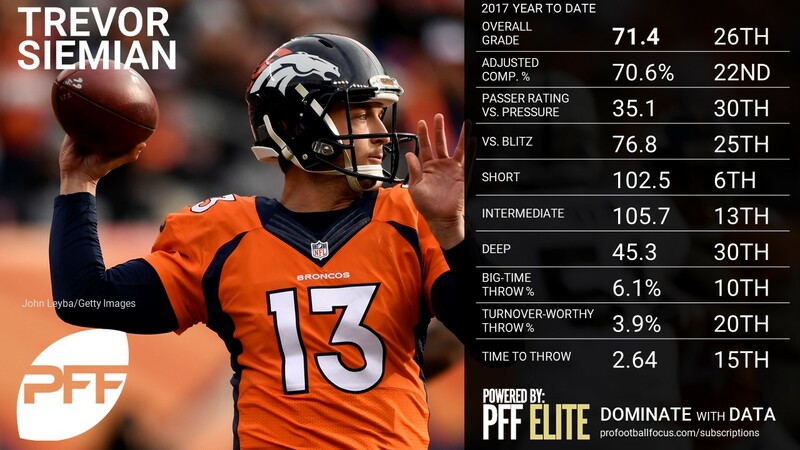 On the day, Siemian was just 2-of-9 for 23 yards one interception and a 0.0 passer rating under pressure. 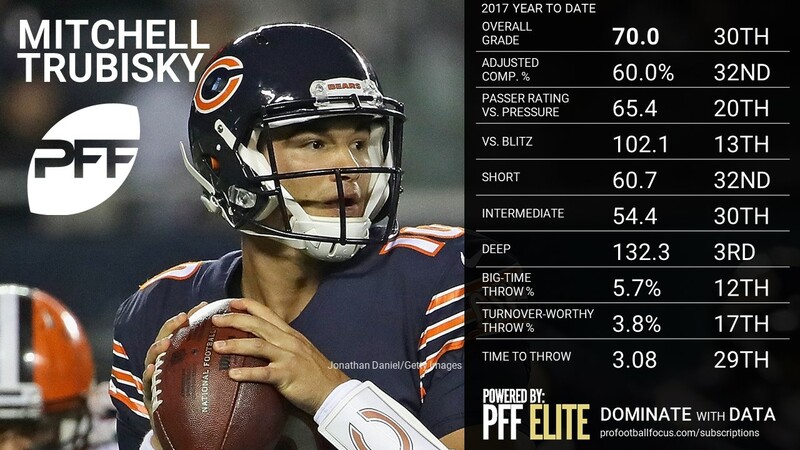 After a rocky debt, Trubisky executed the Bears’ conservative game plan extremely well, ultimately leading to an overtime victory. 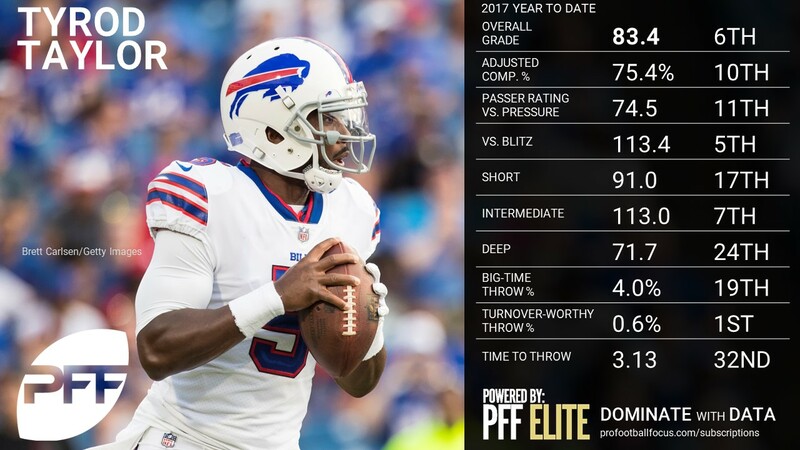 They kept it simple for him with a number of bootlegs and screens, and while his 8-for-16 passing line isn’t impressive, six of the eight incompletions where throwaways as Trubisky did a fine job of taking care of the ball. 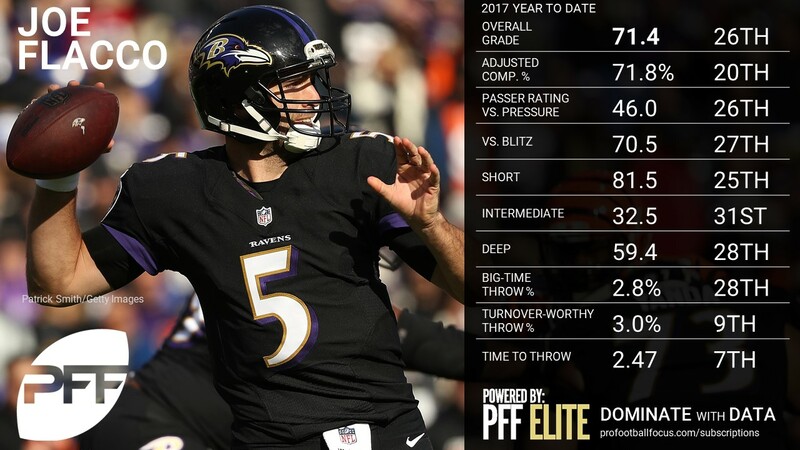 He had two big-time throws on the afternoon, the first a nice pass on the run for a touchdown after avoiding a quick pressure and the second #BTT set up the game-winning field goal as he maneuvered the pocket and put the ball in a perfect spot to complete the dig route. 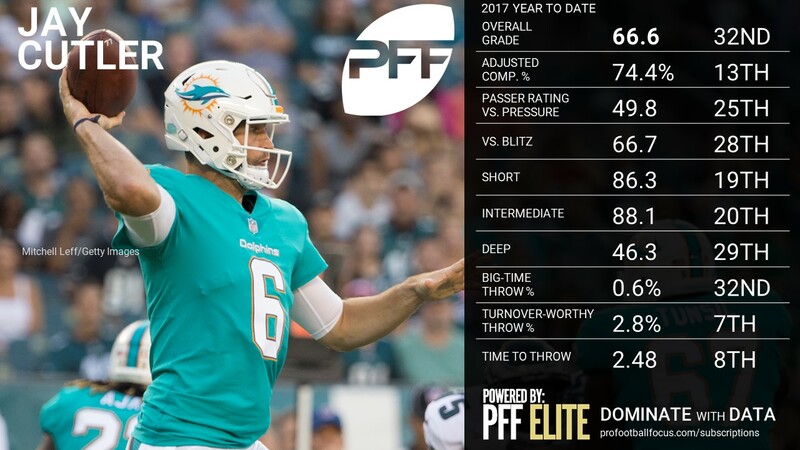 Overall a safe, but solid, second outing for Trubisky.